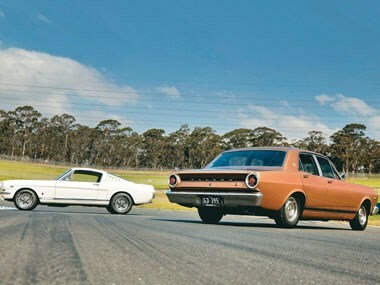 USA vs Oz: Ford Mustang vs XR Falcon. The USA and Australia classics from the 1960s go head to head. Why wouldn't you pitch an XR Falcon GT against a Mustang? Just about everyone else at the time linked the XR Falcon with the Mustang. Ford Australia even branded it as "Mustang Bred". These two cars shared equal billing in their respective countries at the time. The Mustang defined a new, accessible, classless sports car at an unbelievable price and offered something to every American regardless of age, gender, social position, and colour. It was what the Mini was to the Brits, except it made the American dream accessible with style. No Aussie can forget the impact of the XR GT. 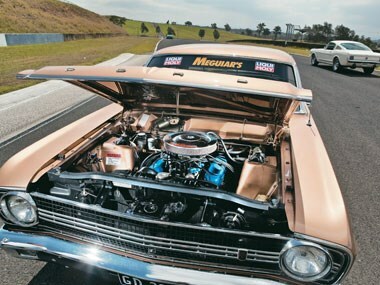 Barely 18 months after Chrysler first offered a V8 Australian family car, Ford launched a fully-equipped, track-ready V8 Bathurst racer and grand tourer for barely $300 more than the relatively soft AP6 Valiant V8. 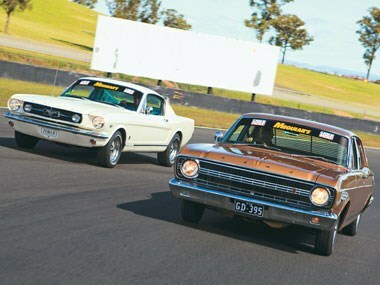 On the surface, the Mustang and Falcon GT appear to be the flipside of the same coin. A chopped-down sport version of a family sedan, and full-sized family car, both built to go long and fast. Each boasts outstanding global competition records, as the XR GT evolved into the London-to-Sydney Marathon team winner. Yet, as our comparison progressed, it was hard to imagine they came from the same manufacturer, let alone were related. As Ponch summed it up: "Other than holding the same steering wheel, they felt like completely different cars." That's because they were completely different cars, as visiting US competition experts (who assumed otherwise) would later discover with disastrous results after they tried to apply Mustang tweaks to the Australian Falcon GT. The XR GT was 1966 US Fairlane-bred; the Mustang, ironically, was more 1960-64 Falcon-bred and that's where the difference lies. 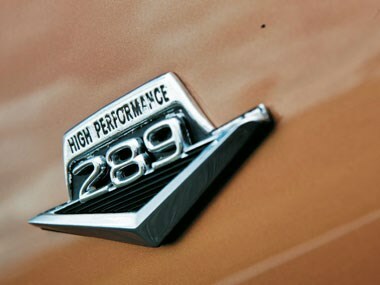 Desperate to get reliability on Australia's variable fuel for that 'One Sunday in October', Ford Australia wisely chose the mid-spec 289ci (4.7-litre V8) for its single specification XR Falcon GT Bathurst special - the one with the small four-barrel carburettor and lower compression ratio delivering 225hp (168kW). The XR GT was a big, heavy car by early Falcon and Mustang standards. Even if it did rewrite Aussie record books for its time, it was a long-distance finisher, not a sprinter. The performance (K-Code option) Mustang boasted a strengthened and much more powerful version of the same engine with a higher compression ratio, bigger four-barrel carburettor and hotter cam that made 271hp (202kW). Imagine this engine in a chopped-wheelbase XM Falcon Hardtop and you get a sense of how hot the Mustang K-Code was. It's why the two cars couldn't have been more different. John Bowe takes up the story: "This car is awesome. I can see why America was captivated by it. The styling is fantastic, its size, weight and feel are sporty and the engine and gearbox work well together." For Jim Richards, the Mustang has extra significance: "I always liked Mustangs and 289 V8 running gear. They started the craze in Australia and I have fond memories from those early days. They still drive very well." There is good reason for this. 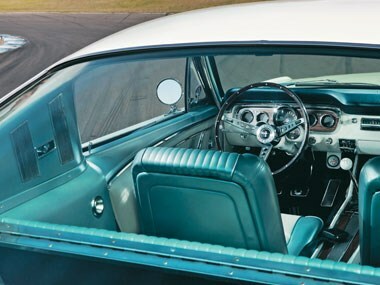 Ford cut the wheelbase of the car we knew as the XK-XP Falcon from 109.5in (2781mm) to 106in (2692mm), lowered the driver's hip point and moved the front seating position closer to the rear wheelarches. 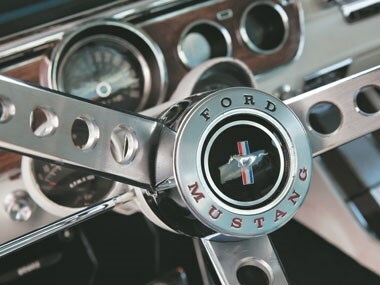 The Mustang's trend-setting long bonnet, short-boot styling reflected its internal architecture so it wasn't just for effect. It was the first entry-level US car to replicate the feel and looks of European sports cars. Yet it evolved from a process that almost delivered a mid-engined, four-cylinder Mustang based on a small FWD German Ford's powertrain. Common sense prevailed after Ford went back to what it did best: simple, reliable, and easily-fixed cars. And cheap. 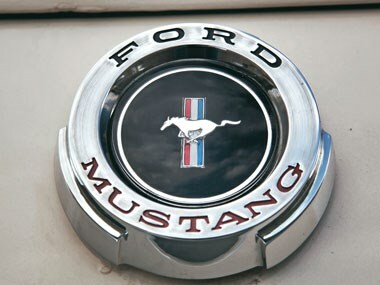 The Mustang's price really was the amazing achievement - about the same as an MGB at entry Mustang V8 level, or a Triumph TR4 for a K-Code Stang. If a Mustang V8 could have rivalled the local $3325 MGB here, we would have soon joined the American craze. That might explain why we're making up for lost time with large numbers of used private imports. 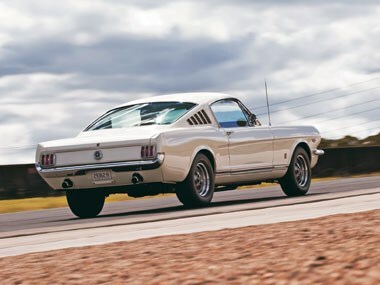 Instead, the few Mustangs offered by Ford Australia during this period cost at least $6500, thanks to stiff import duty, costly RHD conversion, and US-sourcing during a period when Australia was still tied to British currency. To judge the Mustang in this local context would be wrong even if its Aussie price highlights the amazing value of the XR GT at just $3890. Jim Richards is close to the mark when he states: "The XR GT is where the four-door GT [concept] started in Australia and was the best car you could buy in its day." There wasn't anything faster or tougher over shocking Australian roads and certainly nothing at the price. 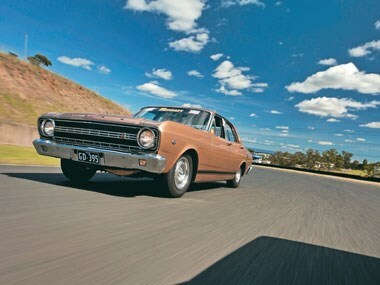 Again, its Fairlane origins counted here, with its wide track, longer 111in (2819mm) wheelbase, loping open-road pace, cabin space, ZA Fairlane front seats (a standout for all judges) and extra body strength. Despite the XR GT's isolation from road shock, which gives the impression of a softer ride than the Mustang, its grip, braking and handling were above average when it was the first of its kind, with standard radial tyres, front discs and sports suspension. Jim Richards says it was probably more significant than the GT-HO Phase III as it was built for Bathurst and succeeded. "It was built from a four-door sedan so its styling was not great but it still looked good. Its unique gold paint added a huge X-factor at the time." 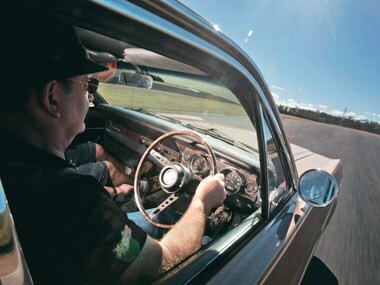 JB is equally effusive: "To me it is the most significant car in Australian automotive history. It started our obsession with muscle cars. The fact that it's a four-door family car gives it extra votes." The battle between the Mustang and XR GT was the closest and hardest to resolve. Ponch summed up the Mustang: "It's lighter, tighter to drive, the steering is really alert, it's just a beautiful car and has so much grunt in any gear." Although the XR GT started out as the favourite, the Mustang quickly undermined loyalties. Mustang defined a global genre that lives on. Its 4.7-litre V8 used cutting edge, thin-wall casting technology, it had sports wheels in an era of hubcaps, its embossed vinyl trim exploited new plastics technology, and separating the grille from the headlights and thrusting it forward has not been improved on, in terms of automotive art. Which might explain why, despite the best credentials, the XR Falcon GT could only become another victim of the Mustang.